Book Summary: "May I present the Last Descendant of Ichabod Crane..."
JASON CRANE just turned seventeen years old. He's a STAR WARS fan and a history geek. He doesn't believe in ghosts or the afterlife. He doesn't believe in psychic powers or tarot cards. He doesn't believe in the Headless Horseman. But Sleepy Hollow will change all that. Because Jason Crane has a heritage to claim. Jason Crane has a Gift to discover. 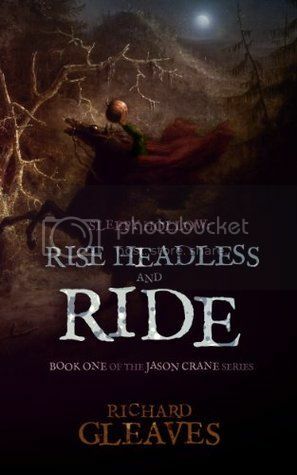 And Jason Crane has an old enemy who will RISE HEADLESS AND RIDE. The series is set in and among the real-life sights and Halloween events of the modern-day locations. Perfect for planning Halloween tourism! Every place mentioned in Book #1 exists for you to explore: Gory Brook Road, the Tarrytown Lighthouse, the ruin of the Horseman Bridge, the grave of Washington Irving, Patriot's Park, Philipsburg Manor and the haunted Burying Ground of the Old Dutch Church. Book Review: Meet Jason Crane, the last descendant of the infamous Icabod Crane from the story, Sleepy Hollow. Jason is typical teenager. He loves Star Wars and history. He is not a fan of sports and tends to approach anything supernatural or paranormal with a scientific skeptism. He is also top of his class. When he finds himself being ripped away from the one home he has known most of his life by his grandmother, Eliza, and to a place known for the story of the Headless Horseman. At first, Eliza is keeping her reasoning for the move secret until she introduces Jason to the descendant of Brom Bones, who is on a mission to find a treasure. Mix in three other characters - Zef, Kate, and Joey. Plus the legendary Headless Horseman and you have a retelling of a famous tale. This book was truly a page-turner. It kept me riveted from the first page to the last page. I hated putting the book down even for a second. The story was refreshing and plot interesting. This was one self-published book that I could not understand that had not been touched by other major publishers. The characters - even the secondary characters - were well-rounded and could stand on their own. I was impressed by the display of depth of these characters. They were not one dimension as other authors often have their secondary characters but these were filled with emotion that you could become invested in these characters along with Jason, his grandmother, and the villian of the story. I loved this book and it is not often for me to really praise a book like this one but I do love this one. I cannot wait to start reading the second and the third books to this. I hope they are just as good as this one. Seriously if you love the story of Sleepy Hollow, then pick up this book. You won't regret it at all.